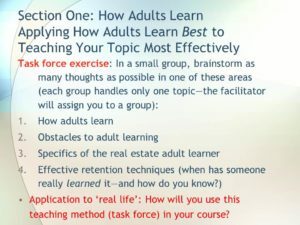 Most real estate courses are not written or taught with adult learning principles in mind. So, let’s look at these truisms and write our courses to reach the adult learner effectively. This is one of the areas we address in my resource on how to write a course (click here to see it). Easier for you to teach! We learn what we already knowa Two fellows teaching community colleges instructors how to teach shared that one with me. How insightful! How do skilled presenters accomplish this in a course environment? Do you relate what you’re teaching to the adult’s prior experience? Or, do you jump right into a complex theory and expect your students to keep up…..
Life is truly ‘do it yourself’. Do you have your students doing an action in class? What happens in your course to assure the students are doing? How do you know they can do whatever it is you are teaching them to do? Observe it in class, of course! Retention soars when adults do and say something at the same time. How are you using this principle in your course? How much doing of significance do you have planned in your class? To live by my own principle, I just increased the amount of ‘student’ teaching I have during my Instructor Development Workshop. The students loved it and showed me I can get them into action faster and more often than I thought! Big principle: How we retain information is directly related to how we acquire that information. Would you say that instructors are most concerned with short-term, or long-term student learning? Use teaching methods to encourage information exchange. How do you assure students are exchanging information? Are you using various alternative delivery methods (not lecture) to assure students are learning not only from you, but from one another? Use several approaches to the same concept/process. Does your course offer review and repetition to assure students are really learning? What rapid recall methods have you seen used in the classroom? 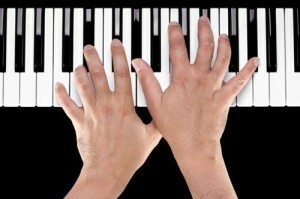 Do you do this so you ‘tie up’ each section before you move on? Experience levels vary greatly. How would an instructor find out each student’s individual experience levels prior to getting into the classroom? When I’m teaching my Instructor Development Workshop, I provide each attendee a ‘pre-conference survey’ at registration, so I can see the needs and level of learning of that person. Even the words used give me some powerful hints about each attendee’s priorities and beliefs! They want information and skills to directly apply to their lives–right away. How have you seen instructors assure that the information is not only applicable, but that the student applies the information to their challenges, while in the classroom? Are you assuring that each of your attendee translates the course information/skills into action plans? Go back to the course your teaching or writing and see if you are adequately addressing how adults learn. Doing so is one of the attributes of a real course, not just an ‘information overload! Come join me to put these creative, fun teaching methods into your course. Attend Beyond the Basics: Advanced Skills to Make that Course Come Alive, coming up April 23-24 (approved for 7.5 clock hours in Washington state). We’ll be working with parts of a course you bring. We’ll put in some great methods and then practice to see how they work–a unique opportunity! 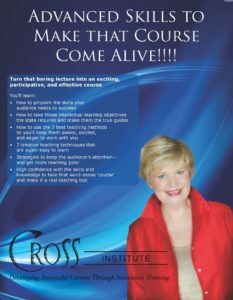 There’s no other course like this–and your chance to get some individual and small group coaching to make your teaching and your course a huge success! Click here to see the course and register. Creating a course? Here are the 6 ‘ws’ you need to answer to assure you have a course–a good course! If you’ve picked up someone else’s course’, and tried to teach it, I’ll bet you know what I mean. Unfortunately, too many times, courses are written from an ‘information organization’ perspective, not a teaching perspective. In fact, because so many instructors have expressed frustration, I’ve just finished a resource on how to write a course (see below). Let’s look at the 6 W’s that you should answer before starting to create your course: The What, Why, Who, When, Where, What Next of your course, so you can clarify what you want to accomplish and gain focus. As I give you these, take time to answer each of these questions. What course do you want to create? Take a moment and write exactly what is in your mind (and heart) about this course. Ask yourself, “Is this actually a course”? Or, is it your desire to persuade people to your point of view? That’s certainly okay in a course, but not as a whole course. Instead, you have a ‘persuasive presentation’. Sometimes we want to impart our beliefs to people or make them ‘be’ in some way, but that’s not a course. (Be responsible, be customer-service oriented, etc.) Now, it’s true that can be one of the objectives of a course, but, just getting in front of people and telling them how they should be won’t make it as a course! Do you see this course as an overview? An introduction? Comprehensive? A series? Why? What are your compelling reason(s) to create this course? Be sure it’s not just all about you…. Who is this course for? What segment of the population do you want to address? One of the mistakes we make is not narrowing our focus to the level of expertise of our desired target audience. What is their level of learning in your topic right now? Who would not benefit from your course? Do you need to narrow your scope for this course? Is this course ‘live’? Is it distance learning? Will it be given as a webinar? Your decisions will direct you to the delivery methods (how you will teach). Note: If you haven’t taken my Instructor Development Workshop, this would be your first step. 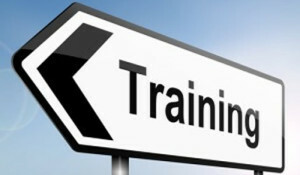 Or, you can take the distance learning version, Train the Trainer. Armed with the answers to the 6 W’s, you can gain a laser focus for your course, and go to the next step of course creation. Expert Guidance to Write that Great Course! If you’re serious about writing that great course, this is the resource for you. Step by step, Carla Cross, who has written courses for Re/Max, Better Homes and Gardens, Keller Williams Realty, GMAC, Royal LePage, and CRB, shows you exactly how to create your course and your outline. And, for those Washington state instructors, she shares tips on how to get your course approved for clock hours. 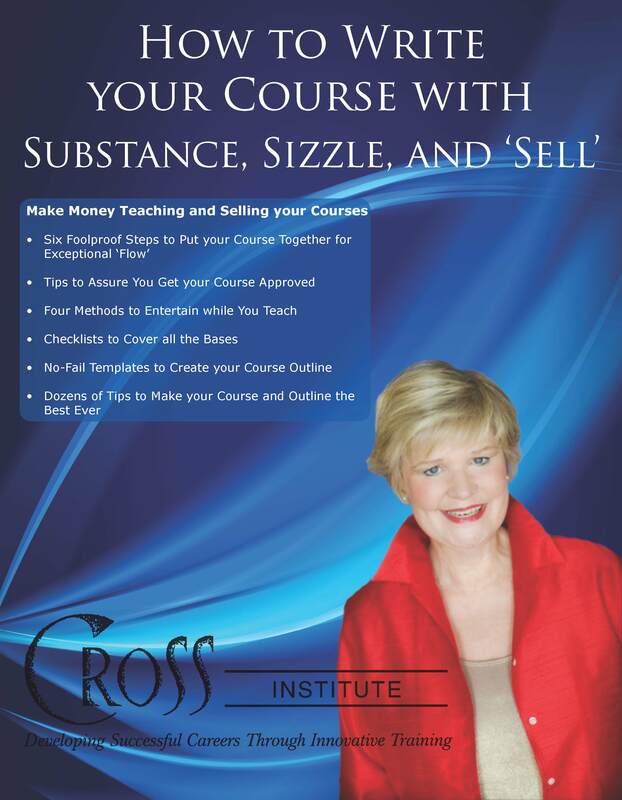 Check out How to Write Your Course with Substance, Sizzle, and ‘Sell’. This resource is digital. You will get access immediately. Bonus: Keys to a Killer Introduction. Most introductions are boring! Find out how to make yours sparkle AND inform. Plus, your introduction should make people enthusiastic about hearing you and adopting your ideas. This eBook and videos will show you how to make your introduction really work for you. Teaching: Here are 3 principles to make those small groups work right. ‘That course was so boring! The instructor talked on and on. I know she knew her stuff, but I couldn’t stay awake!” Have you heard that before? It doesn’t have to be that way! This month, I’m doing blogs on teaching–specifically, how to change it up and quit lecturing your way through the day. I know we have thousands of dedicated real estate instructors. But, we seem to have thousands of bored students! Why? Because most of our courses don’t have a variety of teaching methods built in. So, in this series, I’ll help you build in ‘relief’ from that awful, boring lecture and change it up to keep your audience interested and learning. In the previous blog, we explored the ‘divide and conquer’ method of teaching. One of the configurations of the ‘divide and conquer’ is the task force: Small groups of people working on a common problem. In this blog, I’ll show you a few things to do with that task force to assure it goes right. Most of these principles would also apply to dividing people into groups, too, for role play and other small groups (I’ll write a blog on this later). The task must be something the attendees can do without further information. For example: If you’re teaching Instructor Development, you’ll probably have a section on ‘how adults learn’. You can easily subdivide this topic into 3 or 4 sections. For example, you could have ‘obstacles to adult learning’. You already know that your attendees can come up with several obstacles to adult learning–they have either experienced them or observed them. What wouldn’t work in a task force: To ask your attendees to tackle something that they need additional information or training to accomplish. 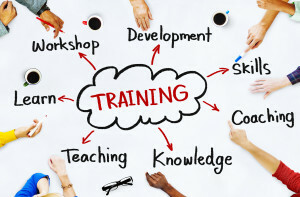 For example–if I were teaching a group of would-be instructors how to facilitate a task force, I couldn’t ask them to write down all the steps to facilitate until I’d taught them the steps. 2. One task per group: If you have several groups, assign only one task per group. What wouldn’t work in a task force exercises: Assigning all the tasks to all the groups, or assigning the same task to every group. Why? Because the first group to report will report pretty much everything the other groups have come up with–an exercise in frustration! (There is a way to do this, which I’ll discuss in a later blog). 3. Put no more than 5 people in a group, so people have a chance to interact easily with each other, and everyone gets to have input. What wouldn’t work: Putting more than 5 people in a group. The ‘outliers’ can’t communicate and only 2-3 people will end up contributing. Task forces work really well at the beginning of a session, to break up your lecture in the middle of the section, and to summarize learning at the end. Where will you employ a task force in your teaching? Let me know! Come join me to put these creative, fun teaching methods into your course. Attend Beyond the Basics: Advanced Skills to Make that Course Come Alive, coming up April 23-24 (approved for 7.5 clock hours in Washington state). We’ll be working with parts of a course you bring. We’ll put in some great methods and then practice to see how they work–a unique opportunity! If You Present: Tips to Stop Them from Being Bored! If you teach: tips to stop them from being bored! Let’s get honest. Do your students get bored when you present? As a student, you know those 71/2 clock hour courses can be killers! The presenter goes on and on. It may be great information, but, after _____ minutes (you fill in your blank), you just zone out (usually about 10-15 minutes!). And, sellers and buyers feel the same way about boring presentations. Here are 2 quick tips to rev up your presentations, increase your effectiveness, and keep your a�?audiencea�� riveted. Dona��t go over 3 minutes in a listing or buyer presentation without asking a question. How about your presentations? Do you drone on for A? hour or an hour without involving your audience? Quit right now. Thata��s where your audience a�?controla�� problems starta��when ita��s all about you. Action: Write down a question you can ask during your normal a�?lecturea�� period. Or, as a listing or buyera��s agent, write down a question you can ask instead of droning on over 3-4 minutes. Quit lecturing your way through all that time! If youa��re doing a presentation, and youa��re lecturing more than 10 minutes at a time, youa��re losing your audiencea��s attention. Instead, break up that lecture with some questions. Better yet, use a�?alternative delivery methodsa�� (all those methods to teach besides lecture!). Those would include breaking students into task forces, or giving small groups a case study to tackle, or role play. You can even do some of this with your sellers and buyers. Involve them in the process! Action: If youa��ve taken an instructor development course, go back and see where the instructor used a�?alternative delivery methodsa��. Then, find a place in your presentation where you could use one of these methods. Keep expanding your horizons! The result: Youa��ll have more enthusiastic a�?receiversa��. Youa��ll have more fun teaching, and youa��ll greatly reduce any audience a�?controla�� challenges. Click here to grab my ‘workshop cheat sheet’, which shows you how to put alternative delivery methods into any workshop–and in which order so they ‘flow’ right. 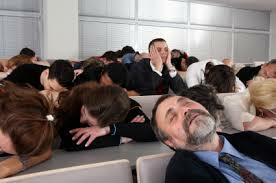 Is the Course You Teach Just a Lecture (read ‘boring’ to students!)? Is the class youa��re teaching (or supposed to teach) full of facts and figures? And, therea��s no instructor manual or guidance in how to teach it? Are you finding yourself talking through ita��talking for hours? (Even boring yourselfa��) Are you struggling to make that course come alive? Bottom line: Youa��ll walk out of this course with the skills to take any boring class and make it highly participative, useful, and fun to teach. Youa��ll get the 3 best methods to use, how to use them, and when to use them to a�?plug them intoa�� any course at the right time. Youa��ll even have time to try out your new methods in your own course and get feedbacka��and watch others, too.A� Why not energize your course, have a better time teaching, and gain business all at the same time?